Livestock farming can be a risky business given the vagaries of commodity prices, so diversifying into energy generation can be an attractive proposition. 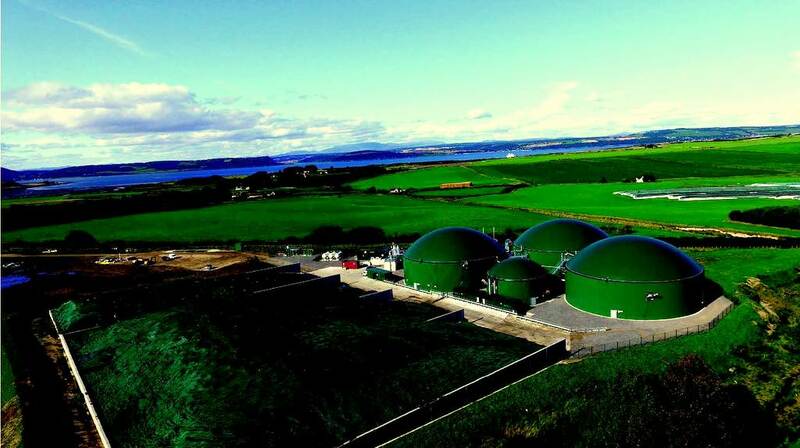 It certainly was to Scottish producer William Rose, who now has an agreement to run two anaerobic digestion (AD) plants near Inverness. “We are mostly organic so have a lot of grass and clover in the rotation,” he explains. Midcoul Farms extends to 1,200 hectares of owned, tenanted and contract farmed land, with a further 500ha on short-term leases or contracting arrangements. Around half of that area is down to grass, with the remainder growing spring barley, wheat, rye and oats, as well as carrots and a wide range of field vegetables. “We do all of our own silaging so have nine trailers, including four big Roadkings,” says Mr Rose. The farm buys about 400 store cattle a year to finish, and lets grazing for 4,000- 5,000 sheep, having sold its own flock last year. The cattle are housed over winter and the manure now goes into the biodigester. Like many farmers, Mr Rose wanted to feed the biodigester with predominantly grass and manure, which can prove difficult. After considerable research he opted for a 1MW Qila plant, which separates the process into two stages, with a hydrolysis tank breaking down the feedstock at different temperatures before moving it into the main tank. The plant converts methane gas to electricity, which is then fed into the national electricity grid. However, subsequent discussions with Qila and Mr Rose’s landlord, Moray Estates, led to a new project – a massive digester which feeds methane directly into the gas network. Equivalent to 2.2MW in size, the plant will serve a new town, Tornagrain, which received planning permission in 2012 and will house 12,000 residents. “The first plant has been running for a year and a half, and the second is coming on-line now,” says Mr Rose. Between them, the digesters will take about 30,000 tonnes of grass silage and the same of rye silage, topped up with about 10,000t of farmyard manure and vegetable waste. About 95% of feedstock is grown within a 10-mile radius, either by Mr Rose himself, the neighbouring estate, or local farmers who are keen to have a new market for rye as an early-harvested replacement for winter barley. “I think ultimately the volume of feedstock will drop as we get better at making it gassy or improve efficiencies of the digester,” says Mr Rose. “We’re trying to get similar quality grass silage to the cattle feed – the higher in sugar it is, the better it works. Crops destined for the digester are stored next to it, and Mr Rose feeds it on a daily basis. While he operates the smaller plant, Qila will run the larger one. Very much like a cow’s stomach, the biodigesters do not like abrupt changes in diet, so he introduces changes gradually over the course of a week. The whole process takes about three to four weeks, and the resulting by-product, digestate, is spread back onto the land as a soil conditioner and fertiliser. “It’s an incredibly effective fertiliser and you can apply it pretty accurately once you’ve had it analysed,” says Mr Rose. Typically, it contains about 5% nitrogen, 2-3% phosphate and 4-5% potash, alongside sulphur and other nutrients. Anaerobic digestion is the natural breakdown of organic matter into carbon dioxide, methane and water, by micro-organisms. The first stage of the process is hydrolysis, which Qila runs in a separate tank to increase efficiencies. The process then moves to the main tank where the micro-organisms continue to break down the feedstock into smaller molecules, eventually ending up with CO2, methane, and the digestate, which is then separated into solid and liquid fractions. Qila designed its AD plants to cope with UK feedstocks like grass and manure, and now has more than 30 plants installed. It does the full project planning, from inception and design to funding, construction, operation and maintenance. Funding has mostly been raised through the Enterprise Investment Scheme, and Qila pays landowners a rent for the site, an operator’s fee and an agreed sum for the feedstock, all of which are typically index-linked for 15-25 years. “As Government subsidies for renewable energy decline it’s more important to be efficient,” explains Mr Thompson. Although the cost of the technology is not dropping – due to the limited number of manufacturers and adverse currency movements – the real opportunity in biodigestion is improving efficiencies, says Mr Thompson. Next Article Attention dairy lovers: Fancy being Minister for Milk? Or Director of Soft Cheese?